With that said, since Nancy posted about bluebonnets - once of the very few things that I miss about Texas, I decided to post a shot of Washington DC in the spring. Which reminded me of an abandoned UFO.... Scrappy blue & yellow (white background) double Irish Chain. I should have had 1 of those colors be the center with the other color on either side, but I didn't Now I am not happy with my results. So I am going to seam rip FOREVER to get the 5 inch squares - so I can trim them down to 3.5 for the Americana quilt. Thanks for sharing your spring. And me, I'm always wishing for spring. It's my favorite time of year. Not that we've had winter yet. It's been in the mid 70s to low 80s now for about a month. We're having a "cold" spell today where it will only get to mid 60s then back up in the 70s again. This might be SE Texas but it's not usually THIS warm in January! Makes me want to get out and plant my garden and hope that we don't get any freezing weather. Heck seeds are cheap, I just might do it anyway. Busy girl!! 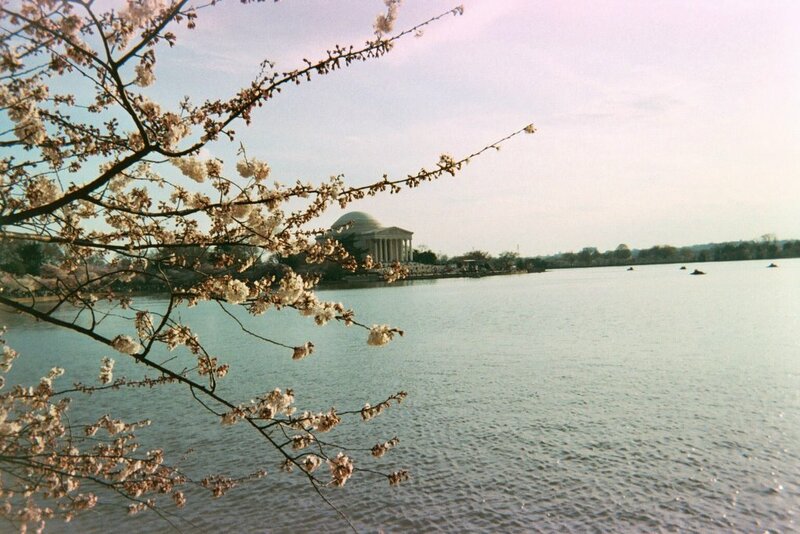 Great pic of DC in the spring. My brother lives in Silver Spring and it's been awhile since I've visited him in the spring. Usually I end up coming out in the fall. 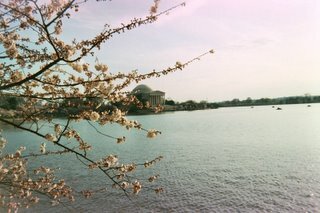 Love the spring cherry blossoms though! I love DC in the spring. I also have the Picture Play book but haven't done a quilt out of it yet. I've been saving the scraps from the kiddie quilts I donate and plan on making one. I like how she uses the leftover fabric for the border too. Beatiful Pic! Thanks for sharing!!! It's snowing here! Sounds like you have lots on the go, and are enjoying it all. Way to go! I made a little houses quilt once with blue and yellow and white. Unfortunately. I hated how there was no contrast, no zing with the yellow and white where they went together and the whole quilt was soooo blah. I ripped it all apart. From now on I'll work with JUST blue and yellow, if I try that again.